Alexandria Ocasio-Cortez and her Green New Deal took center stage on Thursday, and wow! What a proposal! She went over what will happen if the climate isn’t corrected. She went over everything that is wrong with America. And then, she jumped into her solutions. Unreal. This is the future of the country? What do you think of the Green New Deal? Please add your comment below and also please add it to the comments on the YouTube video. So America’s first “darling” after Hussein Bozo is being lapped up, covered up and protected and promoted just like him–did we learn NOTHING? 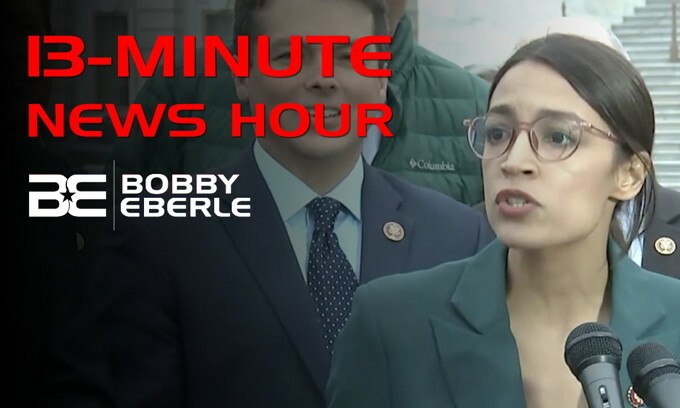 If America is going to buy into this uneducated, ignorant, bug-eyed, horse-toothed ***** pushing her wacko socialism it’s truly and TOTALLY over. Even cadaver, cud-chewing Pelosi is dismissing it. Apparently Not. But when the media is so crooked and the schools so inept, what else do you think would happen? Even Nancy knows Ocrazy’s green deal is nuts. Nancy excluded her from her climate change panel. are you pulling an Elizabeth Warren? If she did graduate, i’d wanna contact that school, and PULL THEIR accreditation, as they obviously are passing Failures! Right now in the ghettos of the Bronx the villagers are looking for their idiot. A few words for AOC… Bye, Felicia! You’re just too stupid to know you’re stupid. Who is voting for these idiots, we need to reimpose literacy tests for voters. With the current crop of college grads, i’m not sure more than 30 or so % would pass EITHER of those tests.. So how does Cortez get around. Does she do it on her bicycle? She should lead by example. If she were to ever get in control, Venezuela would look like childs play. Where to the Dems get these people. Maybe her name tells us something? This stupid little Baby Killer Demorat has no clue how the world works. And listening to her she thinks the world will follow our lead.This little girls has a lot to learn. Since a Socialist is just a Communist without a gun, I suggest that Representative Alexandria Ocasio-Cortez change the name of her Green New Deal to the Red New Deal to honor its economic central planning goal and advertise the massive public debt (red ink) it will create if enacted. However, it is no doubt asking too much of a political opportunist like AOC to admit the truth about her planned power grab to transform the U.S. into a Socialist “paradise”. I am old enough to have watched people on TV who were trying to escape the “socialist utopia” of East Germany as they were shot dead before they could make it through the barbed wire barricades running parallel to the Berlin Wall. I wonder,how soon might we see people risking life and limb, to escape the socialist hellhole the US would become, if these nitwits get their way? The only farts that hurt anything are the moronic farts in the Congress that we laughingly refer to as Democrats. Actually they are communists, socialists, fascists, Nazis, progressives, etc. They are all the same thing with different names. There is nothing democratic about them. Almost as funny as the Green Impossible Dream of Opposable Thumbelina, is your Editorial Headline’s juxtaposition of cows and airplanes: “Say Goodbye to Your Farting Cows and Airplanes”; instead of: “Say Goodbye to Your Airplanes and Farting Cows”. Unless, of course, you consider jet exhaust to be a form of flatulence. she was A.O.C., now she is Idi.O.C…sorry luv! I Suggest to limit the democrats in congress from farting & talking vile—–then maybe we will have more clean air. All their talk about the GREEN deal is taking our green money for themselves. Any reputable ‘insurance policy’ would be ‘fully mature’ after 50+ years and require no additional ‘premiums’ to be paid. However, my monthly Social Security “Benefit” (sic) is reduced by about $150. Also, since the net “benefit” is merely a tiny ‘tip’ compared to the return (interest and dividends) on any honestly-managed retirement investment account, I have a ‘second job’ to supplement my income in order to pay for groceries and utilities. My pay from the ‘second job’ also has Social Security “premiums” taken out of it; on top of a lifetime of payments AND the monthly deductions from my “benefit” money. The criminal Bernie Madoff, who made-off with millions of other people’s money, is a small-time petty thief compared to the Congress of the United States who took (stole) money (and continues to do so) then pay an insultingly small sum in return. Multiply my story by the millions of retired people who paid into the system and were cheated by the Ponzi scheme of Social Security. I don’t say no; I say hell no ! !